Many Mini drivers accessorize their cars with things like checkered-flag decals on the mirrors or the Union Jack on the roof. Colby Trudeau chose something a little more radical. When Trudeau’s family took delivery of an electric Mini E two years ago, they gave the little EV a big upgrade: a 4.4 kilowatt solar-power system on the roof of their San Diego home. Going solar offset the Mini’s operating costs and covered most of the household energy costs, dropping the family’s monthly electric bill to around $25. When the Mini went back to BMW after its lease expired earlier this year, a Chevrolet Volt took its spot in the garage. The Trudeaus are early adopters among early adopters, one of a small but growing number of people who are buying electric vehicles and embracing the idea of true zero-emissions driving. It couldn’t be happening at a better time. Even as electric vehicles gain traction with consumers, the price of solar panels is falling precipitously. The two technologies complement each other, which is why many EV owners are going solar. It’s also why automakers like Ford are teaming up with solar startups to make plugging into the sun easier than ever. Solar-powered EVs are a bit of a misnomer. Most chargers are tied into the grid and use a variety of sources — including the sun — to directly charge the car. But these systems typically produce enough power to offset the electricity drawn by the car, and in some cases send power back to the grid. It’s an ideal arrangement, said Mike Tinskey, Ford’s associate director for vehicle electrification and infrastructure. The automaker recently announced a partnership with SunPower to offer solar installations that offset the electricity needed to power a Ford Focus Electric driven 12,000 miles a year. Critics will argue, “But that’s not a solar-powered EV.” Well, no, not always. Although a car plugged in during the day would be powered by the sun, most EVs are plugged in at night. Going solar lets an EV owner offset that while also selling power to the utility during periods of high demand while charging at night when demand, and rates, fall. The customer base for solar EV chargers is varied. You’ll find green-power advocates, energy-security activists, pacifists, isolationists, off-grid DIYers and professional engineers. They share a fascination with driving without the need for fossil fuels or nuclear power. Of course, a large number of people interested in going electric also are interested in going solar, if they haven’t already. Most of them realize it isn’t cheap — even a modest system will set you back a few grand — but it isn’t the bottom line so much as energy independence that drives them. “The idea that you can actually independently fuel your own car, or cars, with a rooftop solar gas station for a reasonable price has tremendous appeal that cuts across political lines,” said Christof Demont-Heinrich, a University of Denver communications professor and solar enthusiast who runs the SolarChargedDriving.com blog. Demont-Heinrich estimates 30 to 50 percent of EV early adopters have installed solar or expressed interest in doing so soon. It’s an admittedly unscientific survey, once based upon polls at his site and others, including mynissanleaf.com. Still, it suggests a growing trend, one he expects to continue as public awareness grows. That awareness will rise as automakers sing the solar gospel. GM Ventures, General Motors’ VC arm, has invested $7.5 million in Sunlogics and called on the company to build solar Chevrolet Volt charging stations (pictured above) at 12 dealerships nationwide. Earlier this year, Nissan installed 30 solar charging stations at its corporate HQ in Smyrna, Tenn.
On the other side of the coin, several people who already use solar power at home are considering electric vehicles. To that end, companies specializing in home solar systems are beginning to offer EV chargers as well. SolarCity has installed more than 2,500 residential solar EV charging stations, for example, and REC Solar has joined GE to include GE WattStation Level 2 chargers in new solar setups. Until now, most of the solar charging rigs have been homebrew setups by DIYers or systems custom designed and installed by professionals — two approaches that could be time-consuming and expensive. As cars with cords follow the Nissan Leaf, Chevrolet Volt and others to market, automakers are joining solar installers to provide plug-and-play setups you can buy alongside the car. The idea is to make going solar as easy and inexpensive as possible. “We said, let’s size a standard system to offset 12,000 miles of driving per year and let’s get as much cost out of the system by standardizing it,” Tinskey said. The 2.5 kilowatt system SunPower developed with Ford consists of 11 modules, requires 153 square feet of roof space and has a 25-year warranty. It isn’t cheap — Ford’s system is expected to come in for less than $10,000 after tax rebates — but advocates of the technology say prices will keep coming down. “We’re on the cusp of multiple new technologies, and of solar becoming affordable for all the middle class,” Tinskey said. We’ve already seen the cost of solar panels drop 17 percent between 2010 and 2011 and another 11 percent during the first half of this year. Federal and local tax breaks cut costs further. Uncle Sam offers a 30 percent tax credit for solar installation, for example, and most EVs and plug-in hybrids qualify for a $7,500 federal tax credit. A Level 2 (240 volt) charger from SolarCity costs $1,500 installed. The photovoltaic cells needed to keep the juice flowing will set you back $50 a month. By SolarCity’s math, the average urban driver spends about $230 a month on gasoline (at an average of $3.65 a gallon). Plugging into the grid cuts that to $107 a month, and a SolarCity rig brings it to $54. For many people, though, going solar with an EV is about more than saving money. It’s about reducing dependence on petroleum, using domestic energy sources and minimizing their carbon footprint. Anyone who looks only at the upfront cost will almost certainly say, “Why bother?” because you can buy a whole lot of gas for what it costs to install even a basic solar rig. That said, those willing to pay those initial costs eventually will see long-term declines in home energy costs. The savings will eventually offset the cost of installing the solar system, though how long that might take depends upon local utility rates and tax incentives. Tinskey estimates that drivers who use their Focus Electric 300 days annually and drive 12,000 miles will see payback within four to 12 years. The quickest payback is in Raleigh, NC, where state, local and utility rebates have brought the price of the installed solar system down to about $5,000. In addition to falling solar-panel prices, other factors will help make solar charging affordable. Photo: Steve Fecht / Chevrolet. 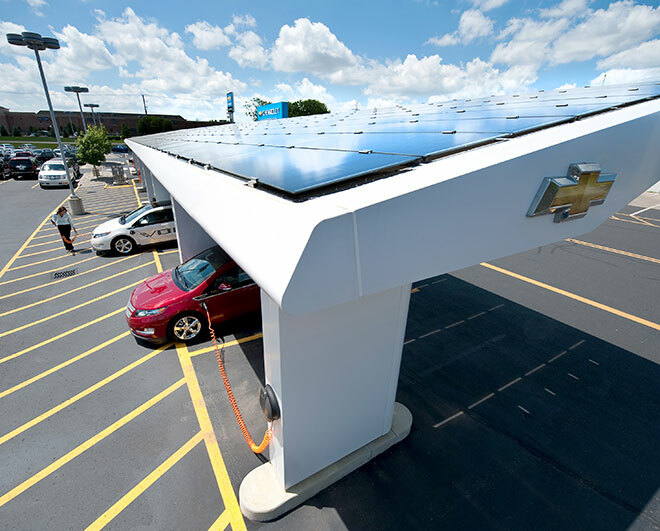 General Motors has installed solar-powered electric charging stations at a dozen Chevrolet dealerships nationwide, including this one in Grand Blanc, Michigan. The stations produce enough energy to charge 12 vehicles daily; anything that isn’t put into a car supplements the dealership’s energy needs.